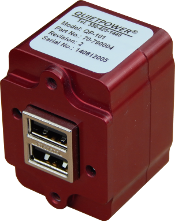 designed specifically for aircraft cockpit and cabin installation and are compatible with both standard and high-power USB. Simultaneously charges two USB powered devices, including cell phones, tablets, radios and GPS devices. An Auxiliary Charging Port is available in the Model QP101-QP104, producing 5, 9, 11 or 12 Volts DC. This port is provided to trickle charge hand-held or remote devices like Hand-Held Radios, auxiliary / back-up instruments etc. Fly with confidence knowing that your backup equipment is fully charged.